When autumn increasingly shows its unfriendly face the time draws near to prepare your bike for its winter slumber. Very brave riders just leave it out in the cold after the last ride, possibly even without a cover. It is easy to imagine what such a poor machine will look like after a few months. And the chances of that bike starting smoothly come next season are about as high as hitting the jackpot in the lottery. But even those who put their bikes in their garages in winter risk nasty surprises in the spring if they fail to take at least some basic precautions: stiff levers, rust everywhere, and a tired rattle as the only response when pushing the starter, followed by silence. 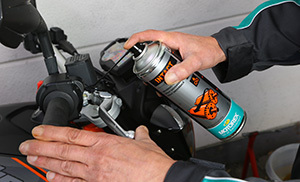 MOTOREX has a great range of care and maintenance products for motorcyclists to use when storing their rides for winter, with the perfect top quality product for every application. The first question that comes to mind when storing your bike for winter is ages old: change the oil now or wait until after the winter? 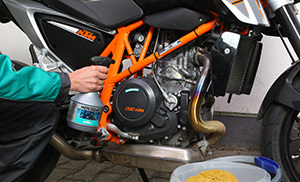 MOTOREX recommends to always change the lubricant and filter prior to storing the motorcycle. This is because the used oil contains substances like acids, water and pollutants that can lead to corrosion inside the engine. Those who do not ride a lot can now carry out the yearly oil change, and those who do ride a lot and therefore need to change their oil several times per year can plan their oil changes ahead in good time. 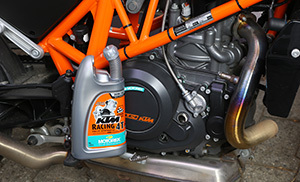 Winter storage time is a great opportunity even for lazy riders to get their act together for once, grab some cleaning and care products and clean the bike. First though you should raise the pressure in both tires by about seven psi and fill up the tank, especially if it is made of metal. This way, the tank is protected from corrosion during the winter. A fuel additive like MOTOREX FUEL STABILIZER delays oxidation, prevents deposits and ensures that the engine will start smoothly even after a prolonged break. In order to work properly though, the additive needs to be distributed throughout the complete fuel system. Just let the engine run a few minutes after adding FUEL STABILIZER so the supplement has a chance to reach even places like the carburettors’ float chambers. Trying to lubricate moving parts after riding off-road makes no sense while they are still caked in mud. First the heavy dirt has to go. At that stage, the only real help is water, lots and lots of it, and maybe even a pressure washer. After that, there is MOTO CLEAN by MOTOREX. This special bike cleaner is simply sprayed onto the dry and cold machine, left on for no more than five minutes, then thoroughly rinsed off with water. Outstandingly efficient, it will even remove stubborn stains like insects, brake dust and tar spots. However, such cleaners should never be used in the blazing sun. For all other work, the motorcycle should be dry as well, so wipe it down carefully and blow dry it with pressurised air if available. This will remove moisture even from hard-to-reach spots. 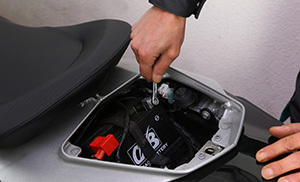 Before getting down to lubricating the moving parts, you can now first take care of the battery, giving the bike a chance to dry off completely. 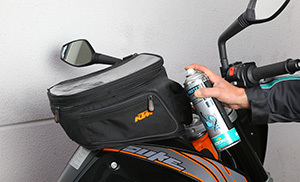 The best contact is achieved with MOTOREX ACCU PROTECT spray. Remove both cables from the battery terminals, first the negative, then the positive, because that way, it becomes impossible to short the battery by accidentally touching a metal part with the plus pole. Wipe the posts down with a cloth, then clean them with a little sand paper. After that, re-tighten the terminals â€“ first the positive â€“ and spray on a thin coat of ACCU PROTECT. 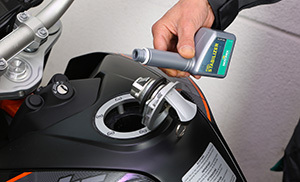 As many motorbikes now have permanent electrical loads like clocks or alarms, it is advisable to leave the negative terminal disconnected over the winter. If you store your bike in a free-standing garage that often cools down to double-digit sub-zero temperatures, you had better remove the battery and store it in a dark cellar. A battery charger or trickle charger is also a worthwhile investment which will prolong the battery’s life and make sure it is ready to use in spring. Next up are the chain and sprockets. Before working on those, it is advisable to cover the floor with a piece of cardboard to avoid stains. First, remove most of the old grease with an old cloth or brush. Then spray the chain and sprockets with CHAIN CLEAN DEGREASER as far as you can reach and leave it on for some time. If you want, you can scrub it in with a brush. Then wipe off the dissolved grease residue with a cloth and lubricate the chain with a spray like CHAIN LUBE OFF ROAD, CHAIN LUBE ROAD STRONG or CHAIN LUBE RACING by MOTOREX. If your motorcycle has a main stand, this is easily done. If it only has a kick stand and you are on your own, you will likely not get around pushing it down the road a stretch. Lubricating moving parts and hinges is important. It is advisable to use a general purpose oil spray like JOKER 440 SYNTHETIC or INTACT MX50, which will creep under moisture and displace it, leaving behind a highly effective protective film. The cans are supplied with a long spray nozzle. This lets you reach even spots that are difficult to access. Which parts need to be lubricated depends on the bike in question. Remember parts like main and kick stands, the hinges of the shift lever, shift linkage and foot brake, hand levers, moving linkages of mechanical clutches and throttle positioners on carburettors. Ignition, seat and helmet locks may also benefit from a drop of oil. Be careful with oiling up cables though. Should they be teflon-coated ones, their self-lubricating effect will be destroyed by spray oil. After these technical precautions for the winter break, it is time to take care of your bike’s looks. 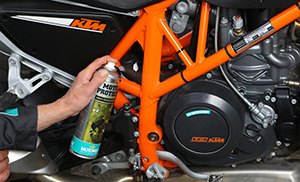 Painted surfaces, chrome and metal parts can be treated with the care and protection spray MOTO PROTECT. Spray the parts, leave it on a little, then rub it in with a clean cloth. The spray is oily, so best avoid getting any on the seat, grips and tires. The surfaces will be protected from corrosion by a thin oil film that is easily removed in spring with appropriate means. It is also a good idea to impregnate leather seats and saddle bags. The proper product for this is PROTEX SPRAY which can also be used to treat riding apparel like leather boots, jackets and trousers. The spray is even suitable for impregnating functional textile riding gear with breathable membranes. On a final note, the question remains of what kind of cover to use. 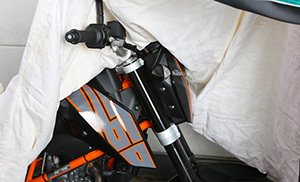 If the bike is kept in a dry room, a simple canvas cover is surely sufficient. If the bike has to stay outside though, you will hardly get around using a waterproof bike cover. Breathable covers are a little more expensive. However, they have the advantage of letting moisture escape that has condensed beneath the cover. If you use a simpler kind of non-breathable cover, you should let it air out once in a while to avoid moisture accumulating beneath it. If you properly store your bike for the winter break, you will be able to make use of the first nice days early in the New Year with little preparation. Apart from that, regular bike care serves to maintain the bike’s value and can even prevent breakdowns and expensive repairs as you notice minor flaws before they grow into major problems. This entry was posted on Tuesday, October 7th, 2014 at 3:33 pm	and is filed under Motorbike and Motorcross news from Trevor Pope. You can follow any responses to this entry through the RSS 2.0 feed. Responses are currently closed, but you can trackback from your own site.